‘Madonna and Child’ by Los Angeles based artist Maria von Kohler, is displayed in a high window at The Premises. Michael Jackson fan sites around the world have been orchestrating a campaign against the sculpture. Although the artwork depicts a real event, with no additional comment, they see it as an attack on the late singer. Amongst the blizzard of misinformed blog comments (see below) is the suggestion that big money is somehow behind it. If only. For the record, the artist wasn’t paid and the work is not being offered for sale. It is not a commercial venture. Perhaps we should also say that quite obviously, the comments below are not to be taken as reflecting our own opinions. So try and be nice you lot, or we’ll set Mrs Watkins the studio cat on you. ‘Madonna and Child’, the sculpture currently on display at The Premises Studios in east London, has generated a large volume of complaints after it was featured on several Michael Jackson ‘fan-sites’. As regular visitors here may have already noticed, there is a new sculpture suspended twenty feet up on the side of our building. 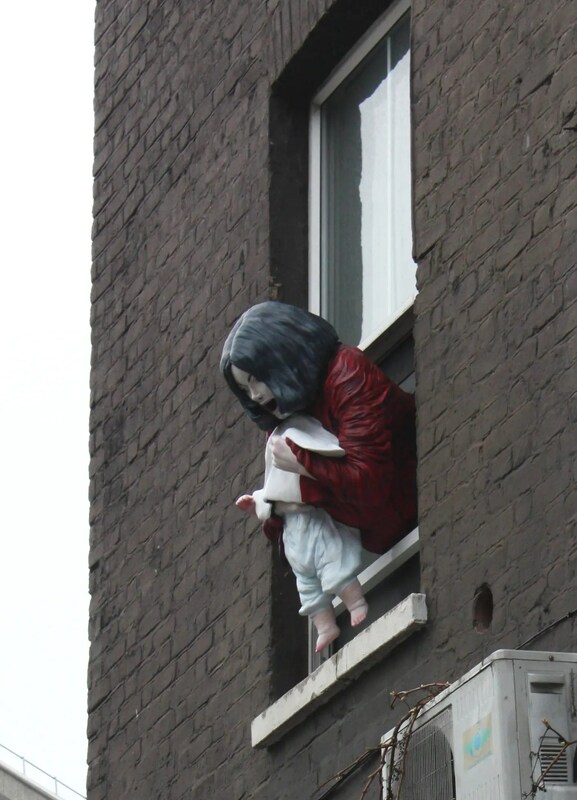 Intriguingly, it’s called Madonna and Child and it’s been installed in our office window. Swedish-born sculptor Maria von Köhler spent six months, first modelling it in clay then, from a plaster mould, it was cast in polyester resin and finished in acrylic and wax. Various Jackson ‘fan-sites’ are orchestrating a hate campaign against us (see blog comments below) thus illustrating the point that the sculpture is really about fan worship, about treating a singer like a deity. Maria von Köhler has exhibited widely since she graduated with an MA from the Royal Academy Schools, Royal Academy of Arts in London in 2003. Her work is housed in collections worldwide, including The Zabludowicz Collection and The David Roberts Art Foundation, London. Von Köhler has held solo exhibitions at Seventeen, IMT and The Kiosk Project, London, as well as Seeline Gallery, Los Angeles and Galerie Lieser, Berlin. Other exhibition highlights include: When We Build Let Us Think We Build Forever, BALTIC, Gateshead; Larry’s Cocktails, Gagosian Gallery, London; National Geographic, Faggionato Fine Art, London; RightOn/Write Off, Chapman Fine Arts, London; Fresh, MOCA, Los Angeles; Selected Sculpture, Max Wigram Gallery, London. I love the music of Michael Jackson. I appreciate his work as a humanitarian. I can’t find anything offensive or disgraceful about this statue. Superb statue. Are you doing postcards?